The design of turret ships evolved from the American whaleback ship that visited the UK port of Liverpool in 1891.The ship SS Wetmore , had a squashed-cigar shaped hull with a turtledeck along ist full length,the cargo hatches being circular structures standing proud of the deck; often referred to as turrets due to the similarity to gun turrets on warships. By 1893 the British Sunderland based shipbuilding firm of William Doxford and Son Ltd had already built their own design whaleback ship-the SS Sagamore. conventional underwater shape the hull of the vessel was stepped inward halfway up the freeboard, the inherited 'turrets' were now joined along their length-the additional space being used for extra cargo capacity. From a distance when viewed from the side these ships appear of conventional design; it is when viewed from ahead or astern that these differences really become apparent. The vertical side of a turret ship curves inward above the load line into a horizontal plane. This flat area is known known as the Harbour Deck, often festooned with bollards and fairleads; on some ships this deck was also surrounded by ( removable) handrails. Further inboard, this 'deck' reverse curved back to vertical; above which was the weather deck .All these elements were an integral part of the hull, and were not part of the superstructure. As such there were occasions when the ships were loaded incorrectly or above their designed capacity, resulting in a centre of gravity that was higher than desired with some accidents occurring. Because of the way in which tonnage was calculated ( measuring the beam at deck level) turet ships were able to operate very economically in areas where tolls were charged- notably the Suez Canal. In 1911 the toll measure system changed at Suez to take into account all cargo space; refinements in the design of ships of more conventional hull form eliminated the structural advantages of turret deck ships. Over 180 ships of the type had been built before the design was abandoned, 176 of them by William Doxford and Sons. They were used in scheduled line and tramp service until retired, wrecked, or lost in the First and Second World War .The Scottish Clan Line, which traded globally in foodstuffs, timber, metals, manufactured goods, case oil, jute, tea, nitrates, and general cargo, used 30 of the type . These ships were particularly suited to the carriage of bulk cargoes such as grains, coal, and ores and several were sold to Canadian Firms and sailed on Saint Lawrence River and Great Lakes of North America . The last of the type was scrapped in 1959 in north America.. The Captain and Officers of the Dutch freighter Blotberg( sic), which arrived in Port yesterday from Rotterdam , did not intend to take any chances being torpedoed by a German submarine in mistake of an enemy's ship. Her 400 feet of hull on either side was painted a bright scarlet at the waterline and broad belt of yellow above, on which, in bright green was the inscription NEDERLANDS. The sign was fifty feet long and letters ten feet high, so that they could be read from across the Bay Ridge shore at Quarantine. Her career under her new house-flag was to be short. After loading at New York she departed on the 8 October 1916 for home waters laden with 6000 tons of grain and 400 tons of machinery for the Dutch Government. Despite more than ample visual precautions, she was stopped German submarine U 53 shortly after leaving New York . . Despite her cargo being owned by the Dutch Government, her neutrality did not afford her protection and she was sunk by torpedo the same day at 20.40 hrs off the Nantucket Light-vessel , at a position 40.40 North and 69.36 East. This error against a neutral ship by a U-boat captain cost Germany dearly in cash compensation , this being paid to her owners and the Dutch Government. Note that despite the name having been changed by the new owners, it would seem that the name on the vessel was not altered...? The use of the term 'funnels' for a single stack ship did intrigue—but I conclude that it was probably simply a typing error. With my new found enthusiasm for early 20 Century merchant ships being fired up by my newly completed Battlefleet Models Drumgeith. 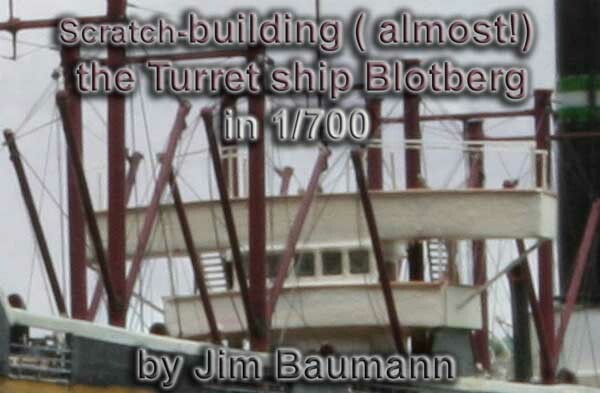 I was eager to expand my miniature mercantile fleet as BFM had announced a forthcoming kit of a turretship. Being inherently impatient however ...-I decided to purchase the Loose Cannon Productions Clan Ferguson model get cracking with. In the meantime I stared to acquire numerous books and postcards devoted to turret ships and intensively studied the -to my eyes- fascinating world of turret ships and their predecessors and derivatives. The kit duly arrived, alas on closer inspection I noticed several disparities between photos of Clan Ferguson and the casting in my hands. These errors were as far as I could ascertain entirely attributable to the incorrect drawings of Clan Ferguson published in the now defunct Plastic Ship Modeler magazine. After measuring the hull I decided I could use the resin block as a basis for the construction of an altogether more exciting vessel with engines aft, ten masts and 18 loading booms...!! With some research , a number of useful photos appeared-and the discovery of the unique colour scheme described above in the NY Times paper my mind was made up—the Blotberg it was to be!!! The first task was destructive and irksome, the removal of all superstructures and slight lengthening of the hull by adding a stempiece and extending the stern. The poop, main and for-deck were now skinned with evergreen N-gauge siding for the timebr decks and smooth .015 for the main deck. Blotberg along with all Doxford-built turret ships had virtually no longitudinal deck spring, but a pierced bulwark along her entire length , the top of which was painted white gave her a pleasing albeit faux sheer-line in side elevation. This was achieved by gluing on thin styrene strips, making out with pencil and the cutting back with a sharp blade. This bulwark was then cut in situ- level with the positions of the cargo hatches; thereafter a strip of very thin micro-styrene strip was glued atop the now curved and pieced bulwark. After a lot of sanding and re-profiling the fwd and aft ends of the ship, adding the upper plating strake and re-drilling all portholes as well as physically lengthening ( by a scale 4 feet!) the hull she was ready for a guide undercoat, followed by more filling and sanding. Much attention was paid in oder to get the correct profile for the 'bulges'-- this being a very sharp angled change of direction . Once all was well, I added the 'plating' runs as best as I could from examining photos. The use of high contrast lurid colours of vynil tape for the plating ensured easy eyeballing of the plate-runs to ensure smooth lines. Although the 'plating' steps were overscale, by the time a few coats of paint had been applied the effect did become rather more subtle! I was very eager to crack on with he build, and after careful measuring and (my) interpretation of the eyewitness account of the colour and lettering set to making some decals on the Computer within the parameters of the hull. Numerous fonts and sizes were experimented with until something that looked feasible was found. I printed the green with a tiny black counter-shade; as the transition from yellow to green lettering was not sharp enough for my liking! At this juncture- based on my photo studies the superstructure midships and aft had been taking shape. The gently curved bridge deck was formed of styrene, with the curve being held in place by strips of paper that had been cut into the desired curve, once applied these strips were then soaked with CA glue and later cut to size with sharp scissors.. The numerous cowl vents were made using different gauges of cored solder wire, bent to shape, drilled out and lastly flared at the mouth using a wooden cocktail stick that had been sanded to the desired shape to act as the flaring tool. The cargo hatches were made using larger gauge V-groove styrene sheet, surrounded by evergreen strips. The bracing gussets were simulated using 1/500 handrail PE cut down-it fitted perfectly and looked the part. The huge number of winches required were supplied by BFM; these were sanded off their wafer and pared further on the bases with a blade to lower them a more; thereafter they had operating handles and rods added from PE scraps. Ladders and companionways were added, the handrails for these being made of white stretched sprue. Masts were brass rod -with the booms being made of Nickel-silver glued into a pre-filed notch on the masts. The masts were deep drilled into the hull, and a simple height jig was used to ensure all masts were of the same height- a task in itself! The mast-king post top-hats were made using WEM aircraft PE wheels! With the large numbers of masts and spars in place the vessel was starting to look the part; great attention was paid to get all the loading booms at matching angles - as confirmed by photos. The bones of the model were now completed; it just remained the task of fine tuning the detailing,items such as hatches, doors,chains, awning frames, figures, anchors etc etc. The Dutch ensign was drawn on the PC and printed as a two-sided decal on my old Alps printer on decal sheet; my ink-jet printer currently refusing to print clean demarcations on white decal sheet! Pulley blocks were simulated using small dabs of white glue, built up in layers and painted dark grey. The sea was again a piece of textured artist watercolour paper; I surmised that the water between the un-loading and loading piers would be pretty flat. The ship was set into the paper and the wake was painted to represent the vessel moving at around 7 knots or so – photos show these ships to be able to move at a fair clip even with the propeller only partially submerged!!! The water was painetd wet-on-wet- the method as I have described here and here. The spray and water discharge was made using white cotton tumble-dryer fluff, the consistency being much less hairy than cotton wool. In conclusion it was not quite the speedy build I had anticipated; lack of plans of that exact ship did lead to a great deal of thinking time, staring endlessly at old photos, head scratching and in the end quite some degree of guesswork!! Despite rotating images to 'side-on' and attempting to scale the photos, some slight proportional issues did creep in which I suppose is inevitable given the sparsity of information to hand. Inevitably a whaleback ship will have to be laid down in my modelroom at some stage..! Having completed this colourful vessel, building a nice easy grey ship will seem like light relief.! The assistance of Bob Wilson and Peter Ohm was instrumental in my understanding of these distinctive vessels. More of by Jim Baumann 's work.